Since the release of the Envelope Punch Board resourceful crafters have been discovering clever uses for the tool, from making boxes, to 3D envelopes, to file folder, to bows. We R Memory Keepers responded by creating the cadillac of all punch boards--The 123 Punch Board! With this tool you can create basic envelopes, envelope liners, coin envelopes, boxes, bows, file folders, and lots more. 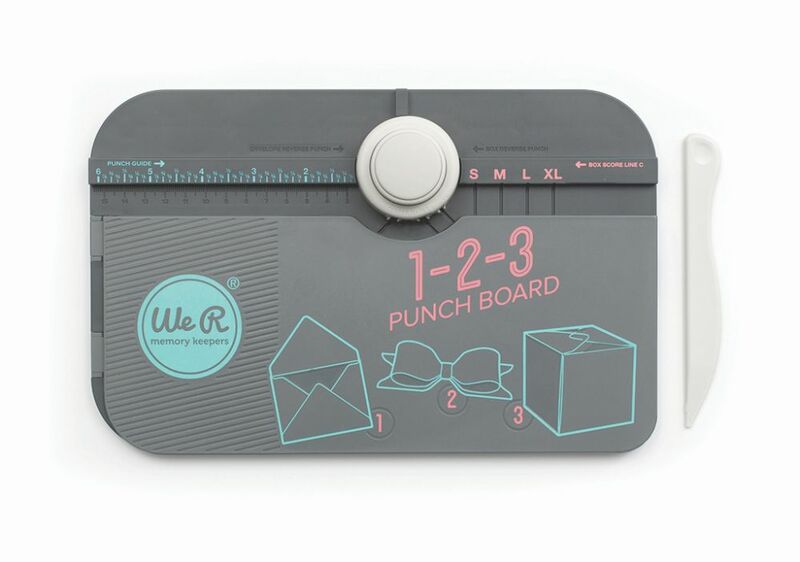 Currently the 123 Punch Board is available at HSN and Michael's, but will be released worldwide on August 1st. I recently created some fun projects with this tool and shared them on the We R YouTube channel. Here's the first one--Mini Favor Boxes. Perfect easy treat boxes to say thank you to party, shower, or wedding guests, teachers, co-workers, or just to say "hello" to a friend. Take a peek! Be sure to check out the We R YouTube channel for lots more instructional videos and project ideas. Very cool! I have the envelope punch board, but this 123 board looks like it can do so much more! A must-have, for sure!